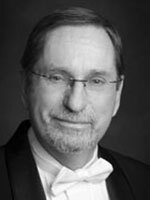 Dr. Thomas Root is Professor of Music at Weber State University in Ogden, Utah. Thomas Root is a native of Minnesota. After completing his bachelor’s and master’s degrees at the University of Minnesota, he received a Doctorate in Music Composition from Michigan State University. The winner of nine Utah Composers’ Guild Awards, he has recently been voted President-elect of the College Band Directors National Association, Western Division. Dr. Root presently serves as Director of Bands and Chairman of the music theory department at WSU. Under his direction, the WSU Wind Ensemble has recently performed as a guest of the City of Chia Yi, Taiwan, in their 1998 International Wind Orchestra Festival, and in 2000 served as the guest performance ensemble for the Chosen Gems clinics of the 2000 Regional CBDNA convention.